Everyone participating in McLean-Great Falls Football must have a valid VA DMV ID card in hand for weigh-in. 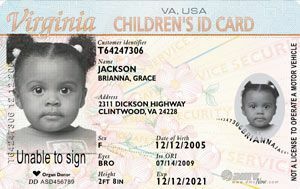 No other form of ID is acceptable to the football's governing body - the Fairfax County Youth Football League (FCYFL). If you don't have your ID card yet, you can still register with us. Just don't forget to get that card!